This Magnificent complex erected on the top of the hill represents one the most stunning Weddings & Events Venues in Italy. It aims wealthy people, especially top class Weddings and Events for a large number of guests, thanks to the sumptuousness of the walls and buildings and the prestigious materials and furniture chosen by the architects to restore the venue and create breathtaking sceneries. An impressive Garden with a central fountain, a typical Italian Garden designed with hedges and a central grove, a green shaded lane that would meet the requirements of an International Movie Set. 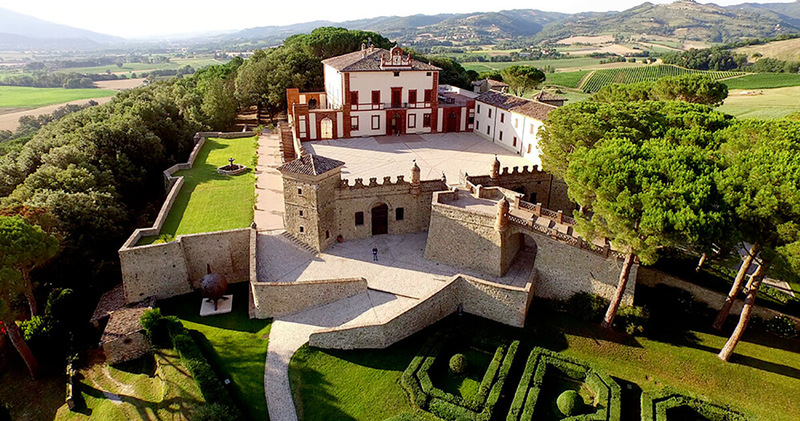 A huge Courtyard in front of the Villa, ideal for Large Weddings or Gala Dinners. You may want host your guests at the Venue for 3 nights (up to 40 people) or rent the Villa for a week with your family and friends, enjoy the peace of the beautiful nature and feel the authentic opulence of a Superb Villa Castle you can find nowhere else in the world. The highly designed rooms are all conceived to offer you the most incredibile and comfortable spaces. We will take care of your Banquets or Meals using reputable vendors with a long experience in fine quality Dinners and important Receptions. Much more than privacy and relax, we could say a really Unique Italian experience. For inquiries on this Supreme Venue reserved to few affluent couples and clients, please contact us and specify your requirements.